The Scheduled Service is perfect for customers who place the privacy of their staff and clients at the heart of their business. We provide PaperBanks – locked, discreet units that can only be opened using a key by select personnel within your organisation and ShredBank operatives. They contain a bag in which important documents can be posted. Then, on a regular agreed schedule, one of our drivers will call at your office and empty the bag’s contents into our mobile state-of-the-art shredders, which are built into the truck for immediate shredding. We also provide you with all relevant documentation including a Certificate of Destruction with every shred and an annual Waste Transfer Note and Environmental Certificate, all of which are essential documents for any audits you may have. 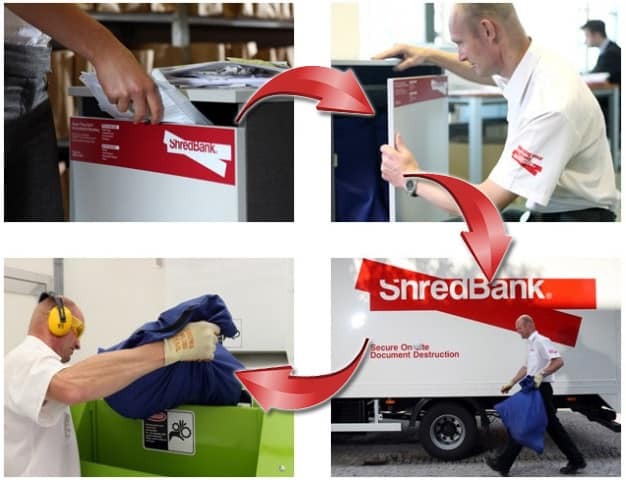 Shredbank offers Shredding Paper, waste disposal, On site paper shredding services.